Event Description : Nav-Srijan Society presents "Burari Mini Marathon" against burning waste pollution. Nav Srijan going to organizing a sports events “BURARI MINI MARATHON” against pollution at Burari By Pass on 28th January. This is our first step & we want you to also join us & support us. The biggest irony of all this is that even if we know that the earth is getting polluted, ultimately it is the human beings themselves who dig their own grave by doing deliberate activities because of which pollution is caused. It does not only spoil human beings’ health but also worsen their quality of life. 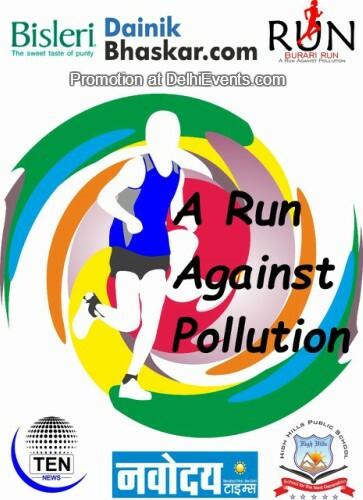 This event is mainly for spreading the awareness for pollution in our area and helps society to develop. So, please come and add your foot-step with NAV Srijan Society for Education & Environment team & participate in Burari Mini marathon. Nav Srijan is targeting this and to create awareness decided to host a Run for cause event. We are planning to create awareness in both government and citizens, and helping them to identify this threat and give an alternative. Like solid waste management in household (Segregation of wet waste and dry waste), recycling products etc. So we would like you with us Step Up and Run for this cause. Step-up run would be an awareness run. Where Step-up mean let’s take a step up to fight pollution and give our future generation clean air to breathe. Step up run will be held in Burari. Burning waste pollution is a severe threat to our living. And most of which is seen in outskirts of Delhi just like in unauthorized colonies of Burari and nearby. Nav srijan would to targeting urban-rural regions like Burari to create an awareness wave. People living in High societies like in central Delhi (near Rajpath and other developed societies nearby) are well aware and dispose their waste in the out skirts regions of Delhi. Here in outskirts the waste is either dumped or burnt. Burning waste causes Air pollution that is incurable. We together are taking step against such actions making Burari and nearby regions as prime target and setting an example for other regions in Delhi to Step up and Run against burning waste pollution.